Vintage Torque Fest for 2019 is happening over the weekend of May 3th and 4th. And, of course, Speedcult is gearing up to bring a whole lot of metal for you to see, touch and purchase. This is always a fun one for us to go to, and Austin has a lot to do in the evenings. If there is a car show you want to make a road trip to… great cars, speedcult metal, great nightlife, cool bands, and Texas liquoring... This is it. If you are interested in inquiring about a custom project, please initiate it at our contact page: https://www.speedcult.com/contact-2/. 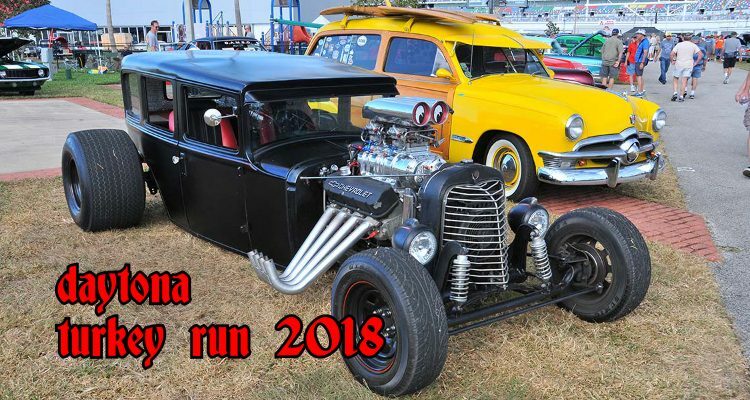 The Daytona Turkey Run 2018 car show is approaching fast. And for those of you who live in the South, or those of you getting away for the weekend to the friendly confines of South Florida… Come on out and see us and see some cool vehicles. The midwests season ending hot rod, vintage cycle, & kustom car bash returns to the McHenry County Fairgrounds. This is a Fund Raiser for children suffering from congenital heart defects. We will have vintage motocross, DIY Stunt show, classic cars, live bands, pin up girls, Icons of pinstriping exhibit and auction, swap meet, and vendors from across the country. Rain or Shine! Ducktail Run is one of the best car shows in the Midwest and includes the James Dean fest and the craziest flame thrower show you have ever seen. Do not miss this one! It's time again for the Frankenmuth Auto Fest, one of the Michigan's largest and most beloved festivals celebrating the automobile. Whether you're a gear-head or just enjoy checking out cool-looking classic cars, you just might want to point your own car toward Michigan's own Little Bavaria. Calling all freaks and weirdo's! This is one car show you do not want to miss. Put on by our good friends Los Punk Rods with over 1,000 custom rods onsite. When: August 31st to September 3rd. One day each year over 1 Million Hot Rodders and Spectators travel to Metro Detroit, the birthplace of the American automobile, to demonstrate and participate in an event that celebrates an ongoing love affair with the automobile. Where: The Dream Cruise takes place along a 16-mile stretch on the historical Woodward Avenue through nine host communities including Berkley, Birmingham, Bloomfield Hills, Bloomfield Township, Ferndale, Huntington Woods, Pleasant Ridge, Pontiac and Royal Oak, in Southeast Michigan. The Largest Hot Rod Show in the Northeast! Over 8,000 hot rods - 86,000 people - 400 vendors make the Syracuse Nationals the largest car show in the Northeast! HISTORY COMES ALIVE AT AMA VINTAGE MOTORCYCLE DAYS. Every year, tens of thousands of enthusiasts join the AMA and the Motorcycle Hall of Fame Museum, and nearly 1,000 independent vendors at vintage motorcycling’s biggest bash. The event includes racing, the country’s largest motorcycle swap meet, seminars, stars from the sports past and present, bike shows and more, all designed to recapture a simpler time and remind us what’s fundamentally cool about riding motorcycles. Where: Mid-Ohio Sports Car Course in Morrow County, Ohio. More than 11,000 street rods, customs, classics and restored vehicles; 1964 & older, will converge for the 45th annual Back to the 50's Weekend. Cars will blanket the streets of the State Fairgrounds for this three day event. The weekend is filled with tons of automobiles, fun, music and more! The 24th annual HOT ROD Power Tour will continue in 2018 with exciting new features for auto enthusiasts worldwide, as the highly anticipated seven-day, seven-city journey is expected to bring together more than 6,000 vehicles and 100,000-plus spectators. The 2018 event will take place from June 9-15. Vintage Torque Fest is a fund raiser designed to help families that have children with congenital heart defects. Vintage Torque Fest is not the typical car show. “There is just too much going on at this show” This is the common phrase heard at Vintage Torque Fest. This is by design. Vintage Torque Fest is much more than a normal car show. If you are expecting to come to Torque Fest and see people lined up behind their cars in fold up chairs…..well….this is not the show for you. There are stages of music, art show, swap meet, vendors, indoor theater, and a dirt track with different exhibitions to get everyone on their feet and moving around. If you are one of those people that sit by your car and wait to see spectator reactions to your car….. this may not be the show for you. Vintage Torque Fest is a participatory show and we need YOU to be a part of the action! Go watch a live band, go purchase some art, make some new friends, find the parts you need in the swap, go watch some action on the track…..before you know it the weekend is over. And you will find that you had a much richer experience than many other shows where you just sit behind your car waiting for the lame car plaques to be handed out. Since its beginning in 2002, the Lonestar Round Up has grown from a humble one-day outdoor car show hosted at an old football stadium to a sprawling weekend-long celebration of hot rods and custom cars for the people who build them, drive them, and just can't get enough of the music, art, history and creativity inspired by and created around them. This year we will have two booths at Autorama. One will be on the main floor and will focus mainly on the official licensed car logo merchandise that we cut for FORD, GMC, Chrysler, Fiat, Jeep, Mopar and a few others. The big booth, as always, will be in the Autorama Extreme area. Just come down the escalator... You can't miss us. This is where you will find our Tikis, devil girls, zombies and more, in addition to the car logos you all love so much. There are live bands all weekend and a Pin-Up contest. Hope we see you there. Get ready for the 44th Annual Daytona Turkey Run. The largest combined Car Show, Swap Meet & Car Corral in the USA.